Heat oven to 325°F. Generously grease shaped Bundt® pan and Bundt® Tunnel Insert with shortening and lightly flour, or spray with baking spray with flour. Line 4 regular-size muffin cups with paper baking cups. In large bowl, beat cake mix, water, oil and egg whites with electric mixer on low speed 30 seconds. Beat on medium speed 2 minutes, scraping bowl occasionally. Stir in lemon peel. Place 4 cups batter in Bundt pan. Place tunnel insert on center of Bundt pan. Fill muffin cups 2/3 full with remaining batter. Bake cake 35 to 40 minutes and cupcakes 18 to 20 minutes. Using sharp or serrated knife, immediately cut off excess cake across top of Bundt and tunnel insert pans. Carefully loosen insert pan; remove. Cool cake in pan 10 minutes; remove cake from pan to cooling rack, placing cake tunnel side down. Cool completely, about 1 hour. 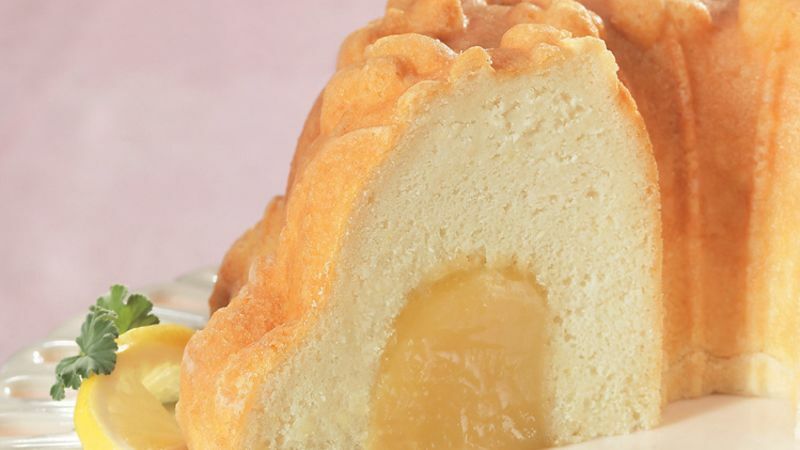 Turn cake over and spoon lemon curd into tunnel. Place cake filled side down on serving plate. Top cake with melted orange marmalade if desired. Store covered in refrigerator. Use grated orange peel in place of the lemon peel to make an orange cake. Melt orange or lemon marmalade to drizzle over cake for an easy glaze.